Non-refundable deposit of $100 required to secure your date. 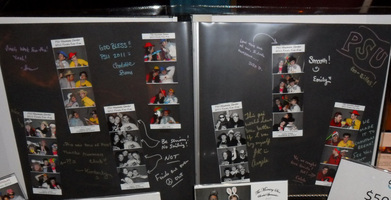 a scrapbook of all your photobooth pictures for your guests to sign throughout your event! We provide unlimited paper and markers to help fill your guestbook with happy memories! Choice of black or white pages. requesting 4x6 photos for your guests. This option also has four shots per picture, with the first shot being larger. 4x6 prints are personalized with your event's logo. The 4x6 option prints one copy of your photos, but the FREE CD/DVD is also included for you to make as many prints as you'd like! This option can not be combined with the guestbook. * School, Church, Private, Community, or Corporate Events may not be scheduled more than two months in advance.